NOTICE: the game is currently in Early Alpha and is freely available for people to play with. If you want to report a bug or give an idea feel free to contact me! 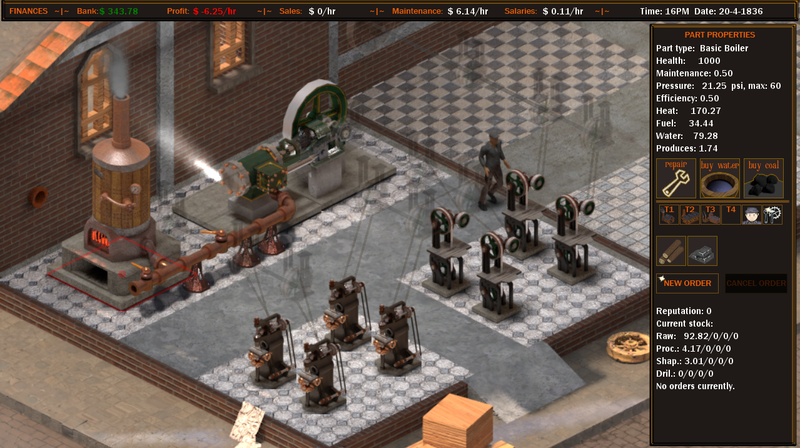 Steam Factory is partly a simulation, partly a tycoon game using isometric graphics. It simulates the various workings of a steam plant as well as the various machinery attached to it, while you have to focus on managing both the machinery as the factory finances, products and personnel. The Early Alpha version 0.2 is released, check the 'Download' tab to get it. New core feature: Orders. You'll now get requests for processed and shaped wood and it's up to you to decide if you can deliver on these. Failing or declining an Order loses you reputation points, while completing it earns you money and reputation. The higher your reputation the more demanding the Orders will get, but the bigger the profit you make per-order. textile and food machines and Orders will be added. Reputation points will also unlock better machinery, when these are implemented. You can build your factory to your liking, taking engineering, safety, costs and practicality in consideration. You'll have to manage the various steam-powered machines as well as your workforce, finances and you have to keep your customers happy by meeting their demands. You build up reputation, getting you bigger and more demanding orders but for an higher profit, while also unlocking better and bigger machines. There are 4 different industries and specialisations you can gain notority in, ranging from wood and metal to textile and food, all of which you can get orders for. Your factories can be created in multiple historical locations such as Manchester and Hengelo, in various scenarios. This also includes a Sandbox mode in which you can go wild without restraint.